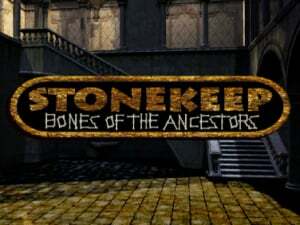 Stonekeep: Bones of the Ancestors, a remake of Interplay's mid-90's first-person dungeon crawler, sounds pretty good on paper. The Wii is a bit short on quality RPGs — especially on WiiWare — and Stonekeep was a decent-looking, competent RPG back in its day. But pre-rendered 2D environments and FMV characters are no longer the norm, and the resulting polygonal translation isn't much better on the eyes. Stripping away all the bombast of the original, you're dropped in with no story, picking one of three doors to choose an ally. This NPC will spawn into the game randomly, helping you out in battle and running you through an initial tutorial. This introduces you to the first problem: the convoluted controls. Simple sword swings are issued by holding the A button, swinging the controller and then releasing the button afterwards. Timing this is way harder than it should be, and the motion commands just get more cumbersome as you go on. 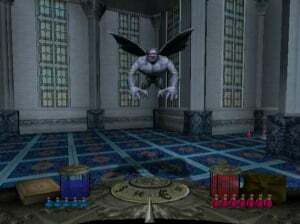 Unlike the node-based movement of the original, you instead move freely in 3D, but the game operates painfully slow, suffering some viscous slow-down in later levels. The snail-like pace makes gameplay quite boring, with random enemies popping up and droning lifelessly about the environments. They often will get stuck in doorways or around corners too, and sometimes never even react to your presence. Battle is frustrating due to being overly complicated, and the game would be infinitely more bearable if the controls were simpler. The pairing of button and motion commands together feels forced, and it would have been far easier to simply press a button or do a simple gesture to swing your weapon. Worst of all are the spells, which require you to draw exaggerated gestures while holding the Wii Remote at a certain angle. The result is spells that require vertically pointed, counter-clockwise "lassos." If only the game had retained the menu-based system of the original, it'd be far better off. Level designs are repetitive with enemies and textures that are just plain ugly. The game looks laughably outdated and the mindless progression revolves around collecting coloured keys and then looking on the map, which shows the exact location of the corresponding doors you can now open. There is really no sense of exploration here, and odd enemies choices like boxing robots completely kill the fantasy vibe. 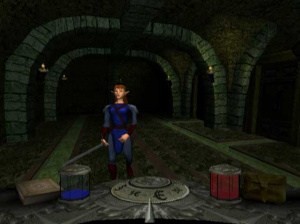 Your life and magic are represented by red and blue jars in the corners of the screen. You collect potions of the same colour to restore them, which the game automatically uses if they get low. Enemies sometimes surround you, which paired with the poor controls makes dying kind of frequent. If you do die, you respawn at the last save point you crossed, which are actually quite plentiful and represented by white dots on the map. One painfully glaring oversight is the game instructions, which are just straight up wrong at times. For example, if you check the digital manual to learn how to strafe, it says to press the C button. Do this in the game though and you'll draw your shield. If you go back to see what supposedly draws your shield, it says to press the Z button. Bingo: now you're sidestepping. You'll be hard-pressed to find a game more difficult to complete than Stonekeep. Not because its design is devilishly clever or because it has fantastic AI, but simply because it is a pain to play. The game suffers from frequent slowdown, a nonexistent plot and motion controls that are completely sanctimonious. Even if a better control scheme were available, the computer you are reading this on can probably play the original 1995 release, which has no right to perform and play so much better than this port. whoa that looks hideous, but actually kinda funny. Not funny enough for 5 bucks, though. 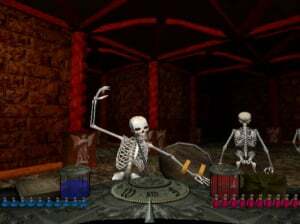 I want to make my own mind up about this game and I'm in the mood for outdated dungeon crawlers. Bring it over to Europe. Dear Nintendo: Park the WiiWare bus now. Please and Thank you. Screenshots doesn't look that bad. The GameFAQs Rating Average is 8.1 (PC-Version). In the german game magazine Power Play 1/97 it scored 77% which means "Good". If you want to read the german Power Play article look here. BTW: The original price was 100,00 DM. @Omega: This isn't the PC version. Oh... I thought I was looking at Daikatana for a sec there. Sadly it's not exactly the same as the PC version. But in action it still does look quite impressing for a WiiWare as this video shows. For the price I think it is at least worth a try. I've got this and I dont think it's that bad. @Bauster: I don't think it's glitchy. I wouldn't say shawdy either. That did put some effort into it. I think the graphics are decent (maybe not the style some like, I guess) for a "3d" type dungeon crawler on wiiware. They have plenty of magic spells and quite a few weapons to use. I do agree that at first I had a hard time getting used to attacking and not dying. I'm better now, though. It's true that there is all sorts of motions to do things (including different motions for different weapons). By the way...it was little easier to avoid getting hurt once I got the shield. It's not easy to remember every magic move, BUT you can stop and practice on the magic menu even in the middle of a fight, not to mention look through em. I try to remember a few spells like one that slows the all the enemies down and a vine one that holds grounded enemies in place. There's just a little intro, that I know of, when it comes to story. I'm starting the 4th level today. I don't quite agree with this score. It's definately not broken and so far I've been able to get through it. I like trying to use different spells to make it easier to deal with enemies. I think this was worth 500 pts. It could have had more story and maybe optional controls (though I think it's kinda fun to do the magic) for people who want them. Not much, that I can tell, in the way of "secrets" except breaking certain barrels. @Omega: I think it was worth it. Though I was frustrated at first trying to get the attacking down without getting killed. I actually thought it looked better than the still pictures to me once I played it. @4: Not until La-Mulana finally hits the US and Europe. I like the game. It reminds me of those games from back in the day like doom, when you have to explore these huge dungeons. There are somethings that bother me about it. Such an example is the "big bat" at the end of level 3. Someone please help me. What do I do. If im lucky enough to kill it, I cant get back over the elevated ledges.. The last ledge, whether I hoover down or jump down I die. But I basically think it is a really good game. Much higher than a 3. @Mrchills: Yup agreed. I keep coming back to it. So I think I'll definately finish it (unless I have too much trouble with the end boss.) In my opinion It's definally not poor, as the 3 rating would suggest. One thing that might help is that dusty slowdown spell. Then just hit it fast (I don't remember for sure if he regenerates like the giant ogre and such. I'm still having fun with it. I Keep getting new spells which is fun. somehow I stopped a bunch of enemies, then wasted them easily. That was cool. oh.. and it doesn't tell you this but, you can kinda look up and down alittle with the nunchuck. It helped me when I was jumping down from those ledges. Just aim for the "mist stuff" and jump to it. @bauckster This isn't the only Wiiware RPG. Theres also Final fantasy IV: the after years. Sounds like Interplay should of moved this to eShop, tweaked it a bit for a June/Ju;y launch. I think this review is a little harsh, I'd probably give it a 6 or a 7. 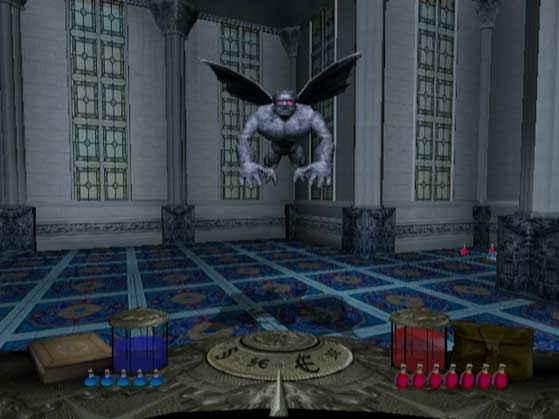 I think the game could have benefitted from classic controller support or a menu system, because the motion controls for the spells are pretty bad. The game is still quite playable and enjoyable though, and at $5 I definately reccomend it. @longtime - I dont think i got the dusty spell out, but ill look out for it. Thanks for the tip. Again, this is a really good game. Controls might be a little peculiar, but once you get used to it, you have endless dungeons to explore. Definitley better than the average wiiware game. @mariofanatic128 There's also another RPG on Wiiware called Sorcery Blade, but it was only released in Japan. Too bad, it looked pretty cool! A 3! Now that came out of the blue (sarcasm)!! This score in unacceptable. How could Interplay release a 3/10? Either the review is wrong or something is very wrong here. Is this like Eye of the Beholder? The game looks pretty cool to me. ^ On Wikipedia they say: "Stonekeep is a first-person RPG in the style of Eye of the Beholder and Dungeon Master. " During the barren rpg days, this came out along with Anvil of Dawn. I went with Anvil of Dawn, and was happy with that choice. But a part of me always wondered about Stonekeep. I was hoping this would be a great chance to play it, but the review puts me off.